Arriving in showrooms shortly, the striking 2017 Civic Hatchback joins the 2016 Civic Sedan and Coupe as the third body style in the 10th-generation Civic lineup. 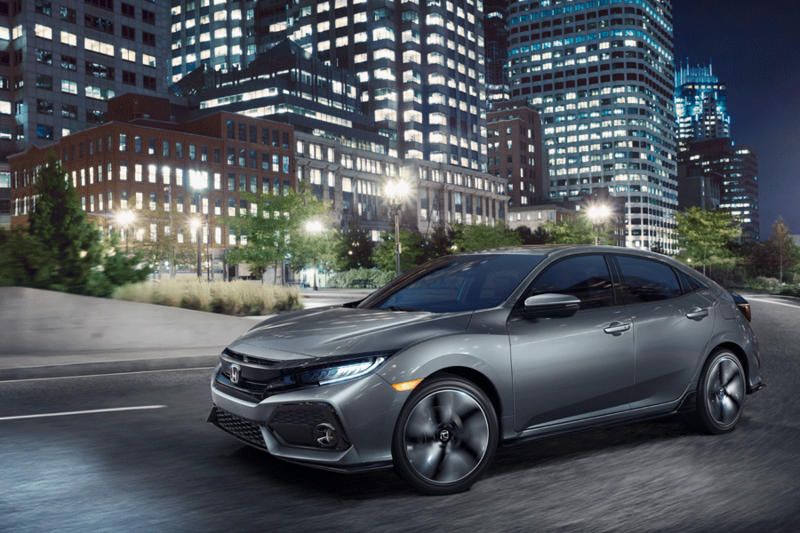 Combining Euro-inspired styling and 5-door hatchback versatility with world-class driving dynamics and Honda direct-injected turbo engine technology, the Civic Hatchback is designed for buyers seeking an even more expressive, sporty and versatile Civic. The 2017 Civic Hatchback will go on sale today with a starting manufacturer’s suggested retail price of $21,390 for the LX with 6-speed manual transmission. The Civic Hatchback’s turbocharged engine can be mated to either a sporty CVT or a quick-shifting 6-speed manual transmission and boasts class-leading city NRCan fuel economy ratings of 7.7/6.0/6.9 L/100km (city/highway/combined; LX CVT). Working in concert with the Honda turbocharged powertrain is the Civic’s more rigid and lightweight body and sophisticated chassis design, featuring a fully independent suspension system with liquid-filled bushings, sport-tuned electronic power steering (EPS) with variable gear ratio, and powerful 4-channel anti-lock disc brakes with Electronic Brake Distribution and Hill Start Assist. These systems synergize to endow the Civic Hatchback with nimble, sophisticated handling and a firm yet comfortable ride. The interior of the 2017 Honda Civic Hatchback carries through on the modern, sophisticated and premium quality of the 10th-generation Civic lineup, with high-grade materials and finishes applied liberally throughout. In terms of packaging, the 2017 Civic Hatchback delivers class-leading volume and cargo capacity, including a roomy interior (2,752L), best-in-class rear seat legroom (916mm) and the largest available cargo carrying capacity in the competitive set (727.7L with rear seats up). Key features include standard Honda Display Audio with Apple CarPlay™ and Android Auto™, heated front seats, retractable cargo cover and more. The Civic Hatchback’s Sport and Sport Touring grade features textured aluminum sport pedals, red-accented instrument illumination and a 540-Watt 12-speaker premium audio system, the most powerful ever offered in a Civic. Available on CVT equipped units is the Honda Sensing™ suite of safety and driver-assistive technologies, which includes Collision Mitigation Braking System™ (CMBS™), Forward Collision Warning (FCW) integrated with CMBS, Lane Keeping Assist (LKAS), Road Departure Mitigation (RDM), Lane Departure Warning integrated with RDM, Adaptive Cruise Control (ACC) with Low-Speed Follow and Auto High-Beam Headlights (HSS) – a Civic first. 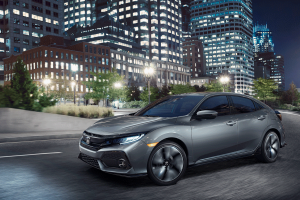 The Civic Hatchback has earned a 5-star Overall Vehicle Score from the National Highway Traffic Safety Administration (NHTSA) and is anticipated to earn a TOP SAFETY PICK+ rating from the Insurance Institute for Highway Safety (IIHS), when equipped with Honda Sensing.